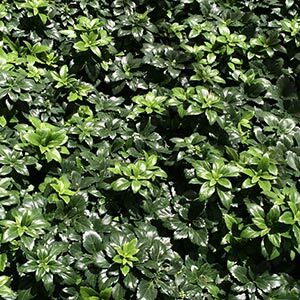 A group of evergreen to semi – evergreen ground cover plants Pachysandra are suitable for use in woodland areas or a semi shaded position. Pachysandra terminalis or ‘Japanese spurge’ is probably the most widely known however other species such as Pachysandra procumbens have some great qualities. Pachysandra terminals and other species are widely as aground cover plant for shaded areas pachysandra terminals or ‘Japanese spurge’ is a low growing evergreen plant that will reach around 20 – 30 cm depending on conditions. Pretty white flowers in spring are an added attraction. 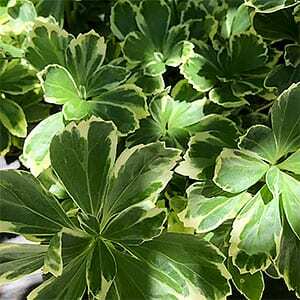 The variety terminals ‘compacta’ is a denser plant with attractive glossy foliage. P. terminals variegata has creamy flecked foliage and is perhaps a slower growing form. The best growing conditions are in a humus rich soil beneath deciduous trees or around smaller evergreen shrubs. This is a suckering plants and will spread but is easily controlled. Shade is essential as hot sun is not suitable. Plant new patches in early spring and water in well with some liquid seaweed fertiliser. Pachysandra may need a little of a tidy up in winter to remove some old foliage, but don’t leave it to late or you might be removing the new flower heads as well. Pachysandra procumbens or Allegheny spurge is another variety we like, it will reach about 25cm and adds some colour to the late winter with pinkish white flowers that are again held above the foliage.